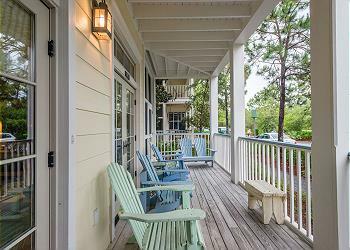 LOCATION: This home is located in WaterColor's Park District, 2-5 blocks from the beach. DETAILS: It doesn't get any more convenient or stylish than this. Find yourself at the very heart of the Town Center in this beautiful ground-level corner unit. There are no stairs to climb, no elevator to wait for. The beach is just a short, pleasant walk or bicycle ride away. 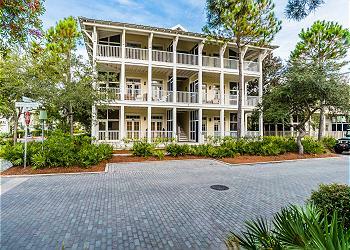 You'll fall in love with the mix of modern decor and old Florida charm. The gourmet kitchen features stainless steel appliances, hardwood floors and designer cabinets. The dining room seats six and opens onto the living room, which has an entertainment center with a TV/DVD. From here you'll enjoy views of Cerulean Park. 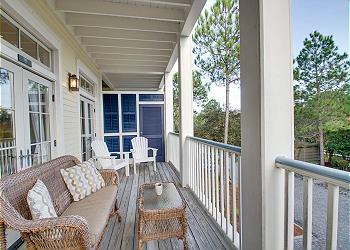 Step out onto the furnished screened-in porch during the evening hours for a drink. This single-story unit has two beautifully decorated bedrooms. The master suite has a king bed, TV/DVD, and its own bath which has two vanities and a jetted tub. The second bedroom has a queen bed and its own tub/shower and single vanity. The second bedroom also has a flat panel TV/DVD. A queen sofa sleeper in the living room provides additional sleeping space. Need to get online? This unit also has high-speed wireless Internet access. This was an awesome property with excellent amenities, location and customer service by the 360 team! We will be back and will even try to get this same unit!